The Indiana bicycle lawyers at Caress Law Group are saddened to echo reports of two serious bicycle accidents that left two Indianapolis teens severely injured – both occurring less than 24 hours of each other. On an otherwise beautiful August day in Indiana, Hoosiers woke up to the news on August 17, 2013 that a 12 year-old Indianapolis boy had been struck by a motor vehicle while riding his bicycle near the intersection of Southeastern Avenue and Shortridge Drive in Indianapolis around 9 p.m. on August 16, 2013. It has been reported that emergency personnel arrived to the scene to find the young boy unconscious. As a result, he was immediately taken to Riley Hospital in critical condition. The 12 year-old boy sustained severe head trauma and doctors were doing their best to try to save one of the boy’s legs from having to be amputated. To make matters worse, a second Indianapolis boy, this one 15 years-old, was struck by a motor vehicle near the intersection of Fall Creek Parkway and 30th Street in Indianapolis, Indiana around 3 p.m. on August 17, 2013. This boy was also unconscious when emergency personnel arrived on the scene, and he was also taken to Riley Hospital with multiple injuries, including head injuries. The vehicle that struck the 15 year-old bicyclist was a blue Volkswagen, but no other details have been released. The Indianapolis bicycle accident lawyers at Caress Law Group send our sincerest thoughts and prayers to the young men severely injured in these bicycle crashes, as well as their family members and friends. Fortunately, the medical providers at Riley Hospital are some of the best in the nation and will certainly do all they can to mitigate these injuries so that these young adults can recover properly. 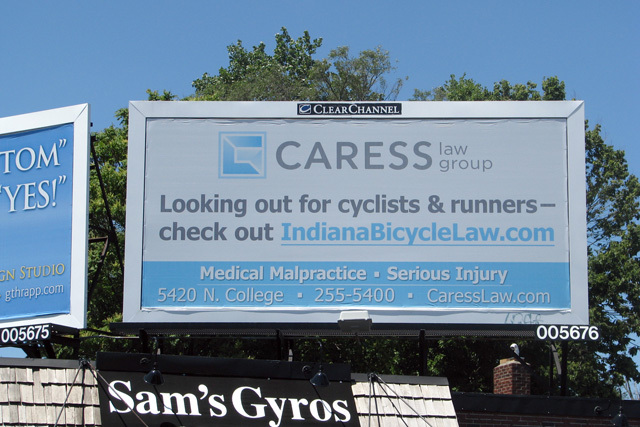 As Indiana’s premier bicycle lawyers, we at Caress Law Group have observed bicycle accident injuries in Indiana skyrocket this spring and summer. We urge all bicyclists and motor vehicles to be cautious on the roadways, particularly when crossing intersections. We will provide any updates on these boys’ injuries and will continue to do our best in advocating for victims of bicycle collisions throughout the State of Indiana. If you have any questions or if we can help you in any way, feel free to call 317-255-5400 or Contact Us for a free and easy conversation. The Indiana Bicycle Lawyers at Caress Law Group are saddened to report another bicycle vs. motor vehicle collision resulting in serious injuries to two young Hoosiers. As members of the Indiana bicycle community, it is eye-opening and deeply saddening to have to report another one of these accidents, as they have been occurring far too frequently within the last couple of months. On August 7, 2013 at around 8:20 p.m., McKenna Davis, age 16, and Stephen Davis, age 12, were riding their bicycles southbound along the shoulder of Indiana State Road 39 in Clinton County, Frankfort, Indiana. At the same time, a Jeep Liberty being operated by Heather McDaniel, age 39, of Frankfort, Indiana, collided with the two juvenile bicyclists nearly head-on. The children sustained severe injuries resulting in both minors being flown to Indianapolis for immediate emergency treatment. The scene of the accident was not far from where McKenna and Stephen Davis resided with their parents and they were likely riding their bicycles home at the time. After the bicycle accident, Heather McDaniel was arrested on suspicion of two counts of operating her vehicle while intoxicated resulting in serious injury and one count of criminal recklessness with a motor vehicle. As is the case with many bicycle vs. motor vehicle collisions, the driver of the vehicle was uninjured while the two cyclists sustained life-threatening injuries. Heather McDaniel was booked into the Clinton County Jail following the immediate police investigation of the accident. 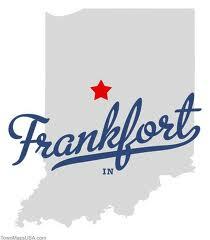 We salute the City of Frankfort for doing its best to prevent these bicycle crashes. Back on April 19, 2013, we posted an article announcing that the Frankfort Police Department was putting on a Bicycle Safety Day for all Frankfort residents. Of course, although impossible to control the actions of all residents, Caress Law Group applauds the Frankfort Police Department for taking preventative measures like this, and, hopefully, bicycle accidents like this one will be prevented down the road as a result of such educational programs. As of August 8, 2013, McKenna and Stephen Davis remained hospitalized in serious condition at St. Vincent Hospital and Riley Children’s Hospital, respectively, in Indianapolis. From one member of Indiana’s proud bicycle community to the other, Caress Law Group’s personal injury bicycle lawyers wish McKenna Davis and Stephen Davis a speedy and full recovery. We also send our thoughts and prayers to the Davis parents and family, as well as the entire Frankfort community. We continually advocate for children to use their bicycles as a form of exercise and entertainment and no child deserves to be injured by an adult due to carelessness or negligence. Feel free to call us at 317-255-5400 or Contact Us with any questions about this post or anything related to Indiana personal injury or bicycle law. Many bicyclists, even veteran ones, are not aware of the requirement to make sure their bicycle has a bell or other device. As you might imagine, the purpose of the Indiana legislature requiring the use of a bicycle bell is to promote public safety. Specifically, bicycle bells are useful in situations where you are trying to pass another cyclist or pedestrian or to give warning to a passer-by that you are approaching. Without the use of an audible device like a bell, the person you are attempting to pass may make a sudden movement or lane change at the same time you are attempting to pass them, which can lead to a bicycle collision with potentially serious injuries as a result. Indiana Code § 9-21-11-8 goes on to also provide that “A bicycle may not be equipped with and a person may not use upon a bicycle a siren or whistle.” Clearly, there are safety hazards that are associated with both sirens and whistles. Sirens can be so loud that they may cause another biker to become startled and make a sudden movement, which could result in a bicycle crash. Whistles would necessitate a bicyclist to use his or her hands to lift the whistle to his or her mouth, which is a clear distraction hazard. Our bicycle accident lawyers recommend you simply purchase a small bell that will easily attach to your handlebars, as this will ensure a safe and law-abiding ride. So, what is the consequence of riding a bicycle without a bell or other audible device? Other than jeopardizing your safety and the safety of other cyclists, if a law enforcement officer were to notice, you would commit a Class C infraction, which would result in a monetary fine. Additionally, if you were to be involved in a bicycle accident in Indiana without a bell or other audible device, and it was determined that this was a possible factor in causing the accident, you and your lawyer may find it difficult to prove liability on the part of the at-fault driver, cyclist, or pedestrian. This does not mean you do not have a case against the at-fault and/or his automobile insurance company, but it may have an effect on the distribution of liability since Indiana is a modified comparative fault state. Caress Law Group’s Indiana Bicycle Lawyers want to make sure that you are safe and also protected when it comes to legal representation should you be involved in an Indiana bicycle accident. For the reason, we recommend you make sure your bicycle is equipped with a bell as required by Indiana law. If you or a loved one has been injured in a bicycle crash, you want to speak with an attorney who specializes in bicycle litigation in Indiana. We devote a portion of our practice to assisting victims of bicycle accidents and have over 20 years of handling such cases. We are happy to help by providing a free, easy, and informal consultation, just give us a call at 317-255-5400 or submit an online inquiry by clicking here. We look forward to hearing from you! The City of Richmond and all who knew Darrell Smith are mourning the loss of a resident who loved to ride his bike. On August 5, 2013, Darrell Smith was riding his bicycle along U.S. 40 near Dunreith, Indiana, located in Henry County, Indiana, when he was struck from behind by a vehicle being driven by 28 year-old Jonathan Wright of Knightstown, Indiana. The Henry County coroner pronounced Darrell Smith deceased at the scene of the bicycle crash. An investigation conducted by the Indiana State Police following the collision determined that Jonathan Wright did not see 58 year-old Darrell Smith, who was operating his bicycle eastbound in the right lane along the white fog line. Wisely, Darrell Smith was wearing a helmet at the time of the bicycle accident; however, he was not wearing any reflective gear nor does it appear that he was utilizing a lamp and/or reflector, which would only be required by Indiana bicycle law under Indiana Code 9-21-11-9 if he had been riding a half hour before sunset and a half hour after sunrise. Just because Darrell Smith was not wearing reflective gear and/or utilizing a lamp or reflector as required by Indiana bicycle law, does that mean that Darrell Smith is automatically at-fault in this accident? These are issues that the Indiana bicycle lawyers at Caress Law Group tackle on a regular basis, which is why we advise that it is so important to seek advice from an attorney any time you or a loved one has been injured in a bicycle accident, automobile accident, or any other incident that occurs as the result of another’s negligence. Feel free to Contact Us or call us at 317-255-5400 to discuss any issue with Indiana bicycle accident law or any other Indiana personal injury issue. We send our deepest thoughts and sympathies to the family of Darrell Smith and the resident of Richmond, Indiana who called Darrell Smith a friend. Darrell Smith appeared to be a great man who clearly enjoyed to travel via his bicycle and was an active member of Hillcrest Baptist Church in Richmond, Indiana. Our message to drivers of automobiles and bicycle riders is the same: share the road, be mindful of your surroundings, and take precautions to avoid accidents.